This entry was posted on September 30, 2016 at 2:59 pm and is filed under Uncategorized. You can follow any responses to this entry through the RSS 2.0 feed. You can leave a response, or trackback from your own site. Most critics comment most favourably on the justly famous scene in which a very ill Captain Vallery nevertheless insists on touring his very ill ship. I feel no responsibility whatsoever towards book critics. The first criticism I ever read was of my first book, H.M.S. ‘Ulysses.’ It got two whole pages to itself in a now defunct Scottish newspaper, with a drawing of the dust jacket wreathed in flames and the headline ‘Burn this book.’ I had paid the Royal Navy the greatest compliment of which I could conceive: this dolt thought it was an act of denigration. Delighted that you are a fan too, Peter. I could spend all day at a cricket match talking about Alistair MacLean novels. Oddly, his best books haven’t filmed all that well. And the best film, Where Eagles Dare, is not one of his best books. When I was a kid everyone seemed to reading Alistair Maclean novels, but it seems his popularity hasn’t endured. You hardly hear about him these days. I remember in English classes at school we had to pick a favourite book and write a review. I picked HMS Ulysses and the teacher liked the piece so much I got to read my piece out in class, along with a couple of excerpts. I didn’t do that, but he was discussed copiously among my schoolmates. I still have my set of paperbacks. 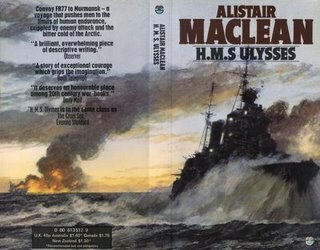 Incidentally MacLean’s Glasgow Herald article, from which I quoted above, was reprinted at the end of The Lonely Sea, a collection of his short stories on nautical themes written *before* HMS Ulysses but published only after he became famous – and all excellent. I reckon his adventure novels peaked around Fear Is The Key and Night Without End, which he wrote consecutively. Two of his more parodiable phrases were that the baddie’s face was often “contorted into a snarling rictus of terror” immediately before he got his just desserts, and he also often spoke of the “preternaturally heightened senses of those who believed they were about to die” (meaning the first-person storyteller, who then somehow escaped death). I remember Fear is the Key, which is really excellent. Go to an Iron Maiden concert. 🙂 There is a song by the same name based on Where Eagles Dare, from their Piece of Mind album. Interestingly, they also have a song called “Fear is the Key”, but it is not based on the Maclean book. Utterly gripping film, often tongue in cheek, as when Clint Eastwood is blasting away down the castle corridor with a machine gun in each hand. Who will ever forget the fight atop the cable car? And was the helicopter really an anachronism?